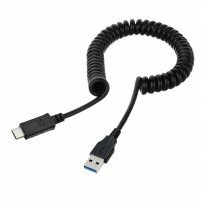 3.3ft / 1m Long Coiled Retractable USB-C to USB 3.0 Type-A Cable for SmartPhone Charging / Data Sync [AP005903] - $5.95 : allputer.com - Accessories for all your Portable Electronics & Computers! - This is a coiled USB 3.0 to USB-c cable. It is with high speed charging and data SYNC too.